For several years, Digital Assistants have been available on our mobile devices – specifically smartphones and smartwatches with voice commands – and have changed the way people consume information, accomplish tasks, make decisions, etc. With important business benefits of smart interactive Apps, the need to support innovation initiatives, and contribute to a successful corporate transformation – that technology, artificial intelligence, machine learning, voice, etc. are expanding in enterprises. Because of this, Chatbots are reshaping Client / User engagement and enterprise workflows. In conjunction with this, while the process may not change the way a Client, Partner or internal Associate does their daily task, a Chatbot can take entire processes off a person’s plate so they can address other needs, provide a value added service, move on to other tasks, etc. Chatbots can now encapsulate both voice and messaging technologies with built-in capabilities and logic to improve the quality and consistency of service delivery, mitigate the need for a human in a standard process, refer the User to a person for specific needs, etc. 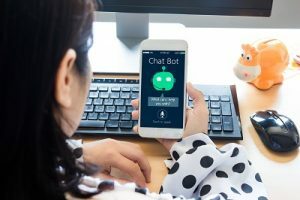 This is in addition to the original use of Chatbots to begin a conversation and connect to a person with the associated information to facilitate assisting the User. With these additional capabilities, Chatbots are now able to improve the User experience as well as enhance productivity with greater efficiencies and reduced operating costs associated with business inquiries, transactions, etc. Because of this, according to a 2017 Grand View Research study, the Chatbot market is going to accelerate rapidly, seeing a 24.3% CAGR and reach a $1.25 billion value by 2025. This includes a significant rise in the number of messaging services Users – which is expected to surpass the number of users of social networking sites. Additionally there has been a significant development in the NLP field, which has resulted in streamlined interactions between computers and human languages. This is an example of the Chatbot ecosystem expanding and including various technologies with interfacing / cross-linking features, etc. to – simplify information services, improve the User experience, ensure Chatbot performance with applications, etc. Because of the benefits, most companies prefer in-built Chatbots on their websites to enable enterprises provide instant Customer engagement / interaction. Importantly, with Chatbots able to interface / integrate with established and emerging technologies (ie: IoT, AI, AR, VR, etc.) with built-in APIs. – organizations have more ways to increase relevance and revenue by extending business capabilities in mobile to expand opportunities. Going forward, Chatbots with AI and audio speech are expected to account for the largest market share. To summarize, Chatbots are here, and gaining traction. As mobile presence in enterprises continues to pervade the workplace, the technologies that come along with it are going to be changing the way we work – for the better. Plus, improve business outcomes. With this. the sooner enterprises accelerate their innovation initiatives, the sooner that get the benefits with Chatbots, IoT, AI, etc.